Biologists have long known that bacteria grow faster and bigger when the quality of nutrients becomes better, a principle in microbial physiology known as the "growth law," which describes the relationship between the average cell size of bacteria and how fast they grow. 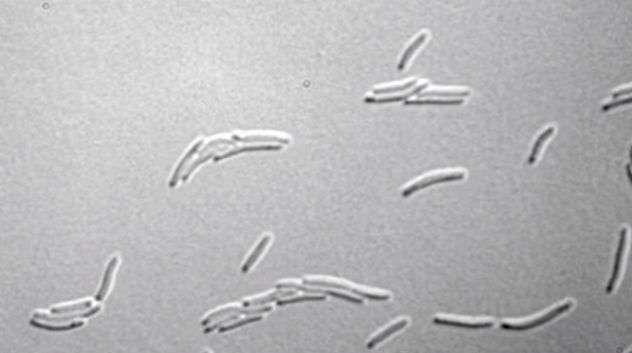 By applying mathematical models to a large number of experiments in which bacterial growth is inhibited, however, a team of physicists, biologists and bioengineers from UC San Diego discovered the reason for this and in the process developed a "general growth law" that explains the origin of these idiosyncrasies of bacterial physiology. The researchers detailed their achievements in a paper published in this week's issue of the journal Current Biology. "A few years ago, we set out to do extensive growth inhibition experiments to test the growth law using the model organism Escherichia coli," said Suckjoon Jun, an assistant professor of physics and molecular biology at UC San Diego, who headed the research effort. "Perhaps not so surprisingly, the original growth law was unable to explain changes in cell size under growth inhibition. Cell size either increased or decreased depending on the inhibition method. Sometimes, cell size did not change at all despite significant growth inhibition." "We realized that this invariant cell size represents a fundamental unit of cellular resources required to start growth and the cell cycle, or the 'engine' of a car, so to speak," said Jun. "This 'unit cell' is the fundamental building block of cell size, and cell size is the sum of all invariant unit cells for any growth condition, explaining the origin of the growth law." Jun said the development of high-throughput cell sampling techniques and genetic methods such as "CRISPR interference" made it possible for his team to extract large amounts of physiological data from 10 million bacterial cells in their growth inhibition experiments. "This allowed detailed and reliable statistics, and led to quantitative modeling that made experimentally testable predictions, helping us to understand the data at a deeper level," he added. "This complements the unexpected 'adder' principle that we discovered a few years ago." "Kepler's elliptical model said nothing about the physical origins of ellipses, but his kinematic modeling was an essential starting point for Newton's work on dynamics 50 years later," Jun said. "We don't know whether biology is following the footsteps of the history of physics, but examples are accumulating that some branches of biology are becoming as quantitative a science as physics."